Anna von Jülich-Kleve-Berg, or Anne of Cleves has fast become one of the most popular wives of Henry VIII. With that popularity comes more knowledge on her life – how much do YOU know about Anne? A special thank you to historian Heather Darsie for supplying the questions for this quiz. Heather is the go-to person on all things Anne in our “small” Tudor community. Amalia and Sybylla were her sisters. Sometimes we see them as Amelia and Sybilla. To whom was Anne’s sister Sybylla married? Who convinced Henry VIII that he should marry Anne? Where did Anne usually reside after the annulment of her marriage with Henry VIII? What did Anne give Henry and Kathryn Howard as a New Year’s gift in 1541? A pair of horses with purple trappings. What was Anne’s brother’s name? Where did Anne and Henry first meet? What was Henry’s first gift to Anne when they met in person? 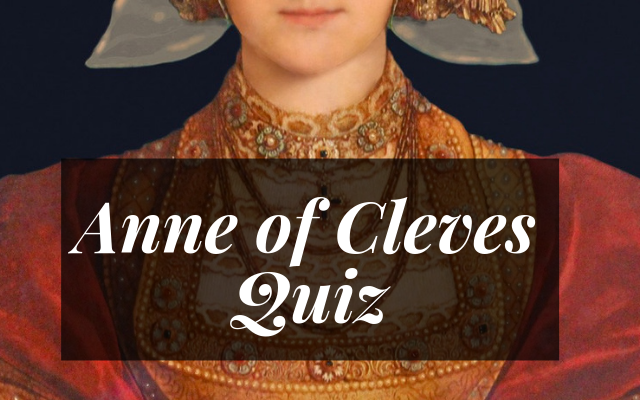 Where did Anne of Cleves die? When did Anne of Cleves die?